This is part one of a short posting series on Watermarking Your Photos. 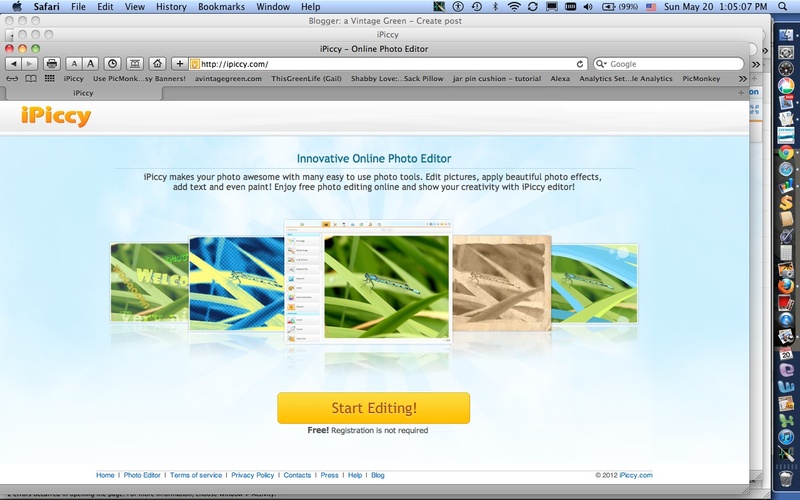 I am starting with iPiccy.com/editor. iPiccy was first out with easy to use collages since the demise of Picnik. 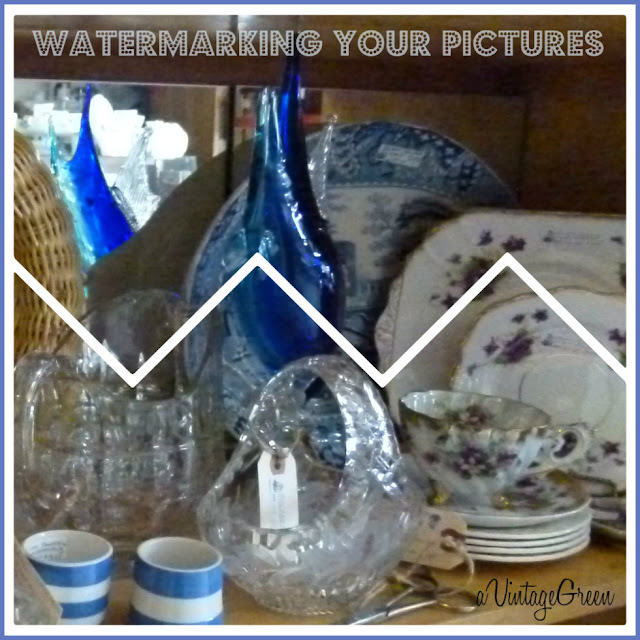 Watermarking - putting text on your photo and then lightening it. This marks the photo as belonging to you. You can watermark without adding a frame or resizing but I like to include all the steps at the same time as I watermark. In iPiccy the first step is to choose your photo. I store all my photos in iPhoto (Mac) so I crop my photo, rename the photo, and then export it to a folder on my desktop for easy access. If you are a Mac User and this is the first time you have used iPiccy there are a few steps you have to go through to get things working. Follow the screen instructions provided by iPiccy. It may seem complicated but it does work if you follow the on screen instructions. Don't be discouraged if things don't work the first time. Start fresh and try again. 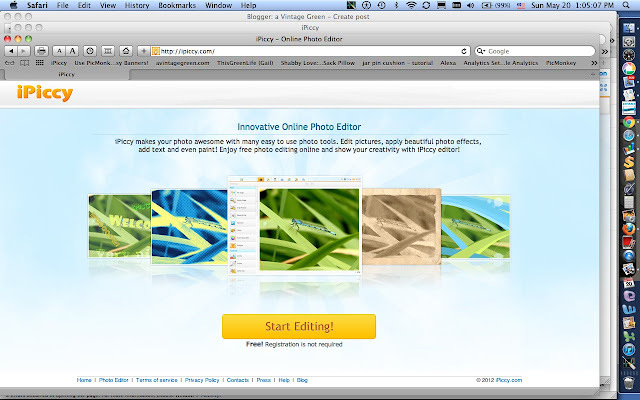 Once iPiccy is on your screen click on the yellow "Start Editing" button. All the iPiccy screen shots below are the property of iPiccy. 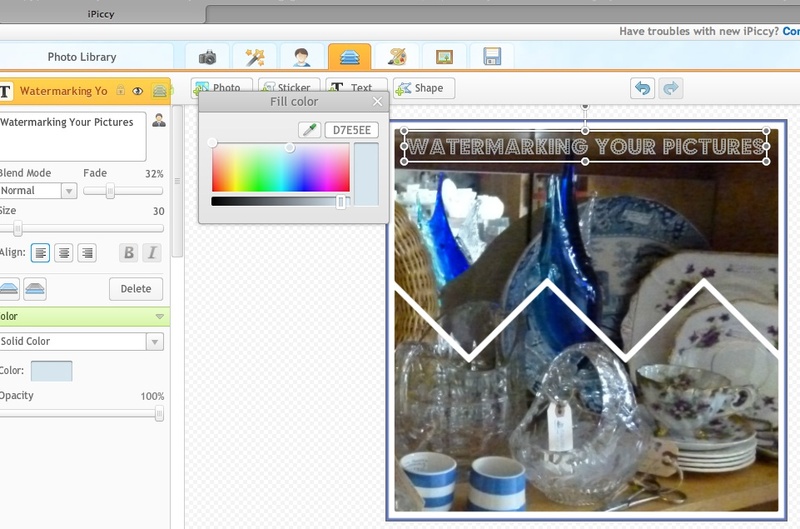 The next screen is where you choose your collage shape and add images. 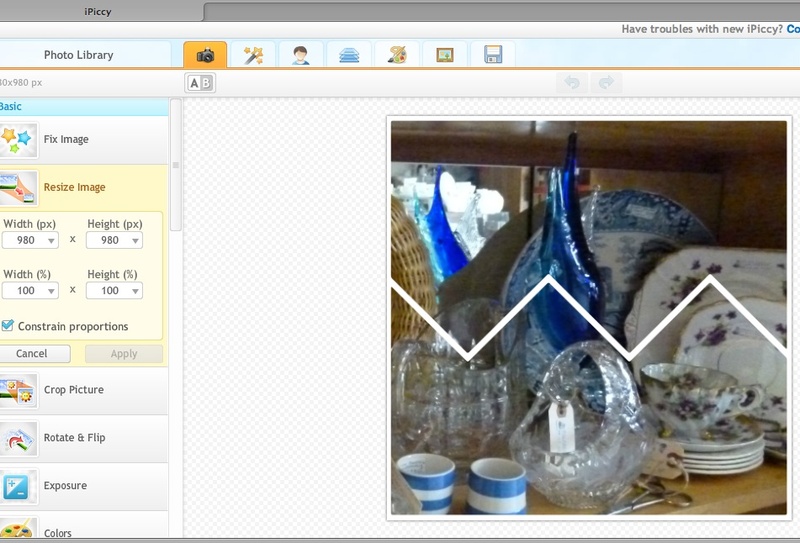 Images can also be added after the collage shape window is open. Once you pick your collage shape you drag your picture/s into the shape and your basic collage is made. 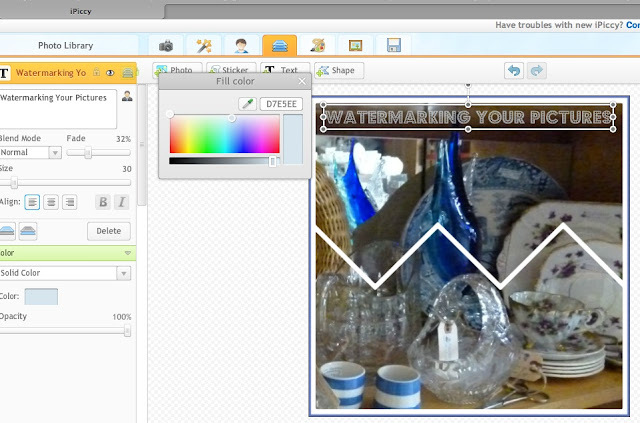 You now have to resize it (camera icon), frame it (frame icon) and add your watermark (sheets of paper icon). 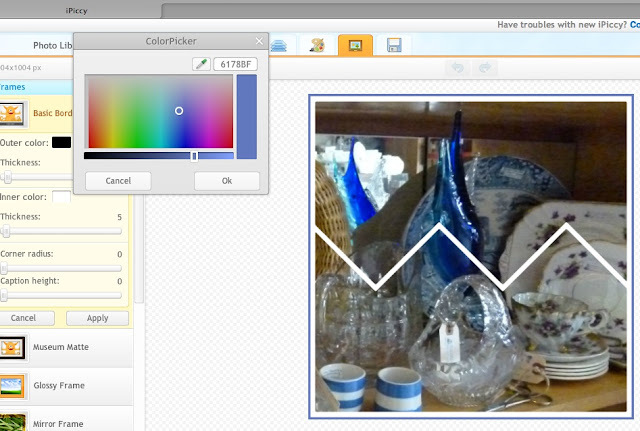 Next I select the frame tool (yellow in the picture below). I pick the type of frame (this one is Basic), the color (a blue to go with my picture) and click on OK to close the color window, and then Apply must be clicked to apply the frame to the photo. click on the yellow icon of a disk to save your picture. Type in the name you want (I used Watermarking1Collage.jpg). I save mine in .jpg (there is a choice on this screen for type of file format you want to use and you do have to select .jpg if that is your choice. Then click on Save Photo! I save my finished photos in the folder with the other pictures for my current post. Here is a second copy of my finished watermarked picture. You can see I have added my blog title (aVintageGreen) near the bottom right corner of the picture. That is my watermark. 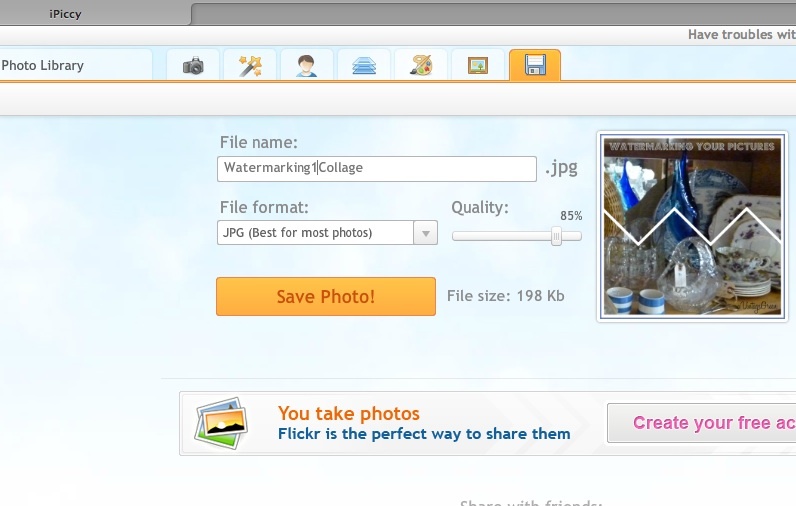 For another way to watermark check out my post: PicMonkey (very easy to use). Joy, Thank you. I've got a bit of time on my hands and I'm learning to use this program. How fun. Tomorrow my blog will be new and improved. Well, I'll have a few more picture in the header. Thanks again. What a good teacher you are!! I think I have said this many times before! I would not be the least bit surprised to find out that you are INDEED a bona fide teacher!! When Picnik disappeared, I panicked. 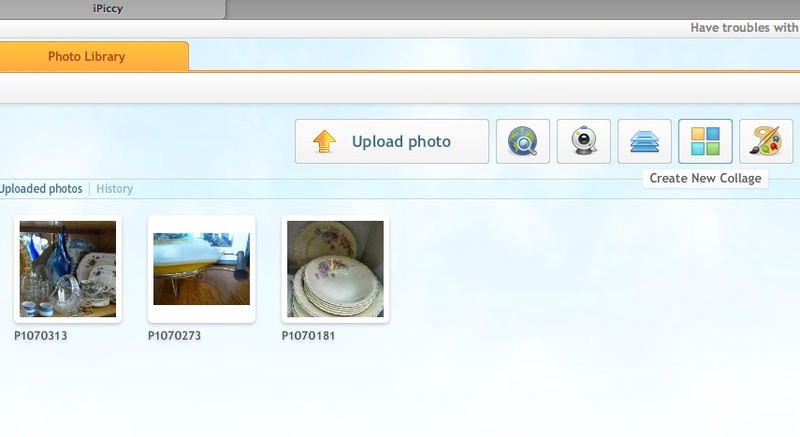 When I discovered iPiccy, I did the happy dance! I love this photo editing site. So very easy to use and very user friendly! Thanks for the great tips! I so need to check out iPiccy. I'm still using Publisher and need to progress. I'd love for you to link this up to Titus 2 Tuesday tomorrow on Cornerstone Confessions. Joy of Comforts and Joy sent me over to your blog, thanks for all the editing tutorials. I haven't heard of ipiccy before - looks good, I shall have to check it out! I just have to try this out. I need to start watermarking my photos but just get overwhelmed when I try. Great tutorial! Just dropping in form Manic Monday to check out you tutorial and to invite you to Freedom Fridays. So hoping to see you there!